There's no plaque for all-time top-scorer, but maybe there should be. Let the kids look for sticks and critters while you enjoy the peace and quiet. Stuff that fridge to the gills - the kitchen's perfect for eating in. Just you, the breeze and the occasional kids' request help with DVDs. Bring your cat or dog. Close to Silver Dollar City and Outlet Malls. Access to championship golf courses. Westgate Branson Woods Resort and Cabins is tucked away on one-hundred and forty-five wooded acres in the heart of the Branson Theatre District, just minutes from the flashing glitz of the strip. The resort is located in a gated community, giving your family peace of mind for your vacation. This place knows how to keep your whole crew happy as freshwater clams, from the volleyball players and swimmers to the nature-walkers and critter-pointer-outers. Get your day off to the right start with a Starbucks coffee from the on-site market. Hop on rental bikes and wheel around the grounds, or challenge the kids to a three-pointer contest on the basketball court (prize TBD). The pool setup has your back, even if the weather isn’t cooperating. There are two seasonal outdoor pools, an indoor pool and hot tubs, ideal for the chillier months. The kids will never be bored thanks to the children’s playground and the activity center, which features ping pong and foosball. When it’s time for lunch, check out the on-site Sports Bar & Grill or the pizza restaurant. Air-conditioned one-bedroom condos sleep four guests and have everything you need to feel right at home. Prepare anything from microwave pizza to a four-course meal in your full kitchen. Cable TVs with DVD players provide in-suite entertainment. Catch a sitcom rerun or have a family movie night. Pack DVDs from home, call everyone into the living room and light in a fire in the in-suite fireplace. Put one of the kids in charge of choosing the movie and another on snack duty and get ready to be entertained. Once the kids have drifted off to dreamland, enjoy a relaxing soak in the in-suite jetted tub. Upgrade to a one-bedroom grand condo for more space, or a one-bedroom deluxe condo for an in-suite washer/dryer. Two-bedroom condos sleep six guests and include a washer/dryer. Upgrade a two-bedroom grand condo for more space and the ability to sleep up to eight guests. Good news! Your four-legged family member doesn’t have to miss out on all the fun. The resort is pet-friendly. Hit all of Branson’s best with easy access to the lakes and championship golf – or brave the rides at Silver Dollar City. Dolly Parton fans should check out the Dixie Stampede Dinner Theater. It’s located in a thirty-five-thousand square foot arena and includes a four-course meal and a horse show with thirty-two horses. Ripley’s Believe It or Not will be a big hit with fans of the Believe It or Not cartoons. It showcases Robert Ripley’s personal collection of “eclectically bizarre” artifacts. 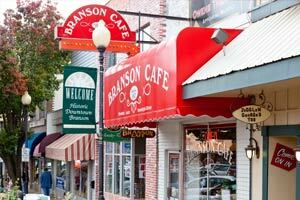 Branson Landing offers a variety of shopping and dining. Pick up some bubble bath for your in-suite jetted tub at Bath & Body Works. Kids will love creating a stuffed animal at Build-a-Bear or a toy car at Ridemakerz. Treat yourself to a premium scented candle at Yankee Candle. Hungry? There’s Buffalo Wild Wings, Joe’s Crab Shack and Pie Five Pizza Co.
You don't have to travel far to enjoy great entertainment. Tribute shows range from Motown, Patsy Cline, Elvis and The Carpenters. Don't miss the Acrobats of China, Clay Cooper's Country Express and the Grand Country Music Hall.